This is definitely one of my favorite recent projects! I know you will love this sweet Dixie dresser just as much as I do! It had an absolutely lovely bowed front, and bail-style drawer pulls in great condition, but just really needed a little TLC to truly shine. 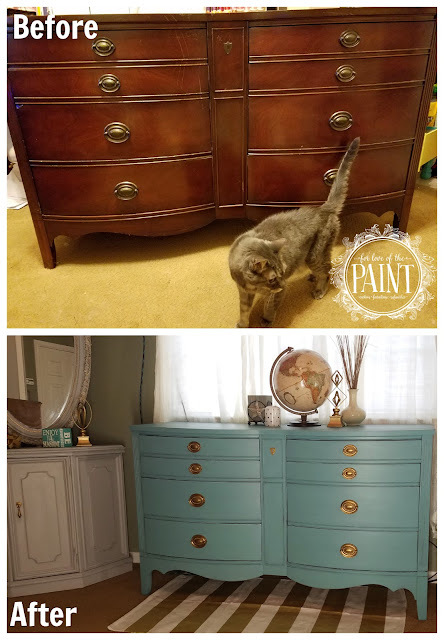 I painted this beautiful lady in Annie Sloan Provence Chalk Paint, layered slightly, then lightly distressed. When it was sealed, the color became absolutely radiant! The gold update to the hardware makes it just perfectly chic. I used a gold leaf colored Rub n Buff for a quick but impactful addition! Can you believe this is the same piece? I loved it so much I can't sell it! It has been moved into our guest bedroom that is slowly but surely (mostly slowly!) being updated. Can't wait to share more of our DIY home updates!